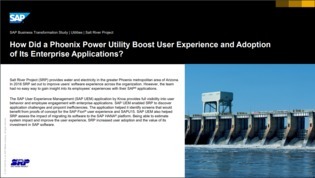 Water and electricity provider, Salt River Project (SRP), struggled to gain insight into its employees’ experiences with their SAP applications. In this case study, explore how the SAP User Experience Management (UEM) application by Knoa helped SRP gain full visibility into their user behavior, and improve employee experiences within its SAP applications. To read the full success story, explore this case study, and decide if an SAP UEM system from Knoa is right for your organization.